Surface Mount Technology has had a profound influence on the electronics industry, and has led to the use of new materials, techniques and manufacturing processes. 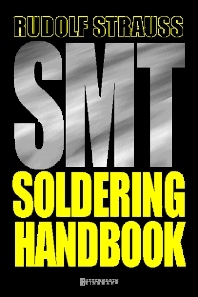 Since the first edition of this book was written, electronic assemblies have continued to become still smaller and more complex, while soldering still remains the dominant connecting technique. This is a comprehensive guide to current methods of soldering components to their substrates, written by one of the founding fathers of the technology. It also covers component placement, the post-CFC technology of cleaning after soldering, and the principles and methods of quality control and rework. New sections deal with Ball-Grid-Array (BGA) technology, lead-free solders, no-clean fluxes, and the current standard specifications for solders and fluxes. Dr Rudolf Strauss has spent most of his working life with a leading manufacturer of solders and fluxes. He was responsible for a number of innovations including the concept of wave soldering, and for many years has been active as lecturer, consultant, and technical author. His book explains the principles of soldering and surface mount technology in practical terms and plain language, free from jargon. It is addressed to the man, or woman, who has to do the job, but it will also be of help in planning manufacturing strategy and in making purchasing decisions relating to consumables and equipment.